The payroll details report is a quick way to view and modify an employee's timeclock records. To view this report navigate to Manager > Reports > Labor > Payroll Details. 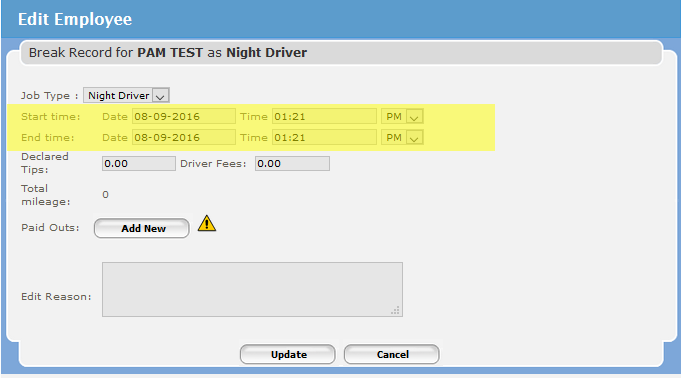 Select a start and end dates that you would like to review and then click Generate. The report will display all the employees that have been clocked in on the dates that you have selected. Auto Clock Out: Auto clock offs occur if the employee forgets to clock off, after 16 hours. The clock off time is set to the clock on time for a total of 0 hours. This must be edited to reflect the proper clock off time. TR: Stands for Time Record. 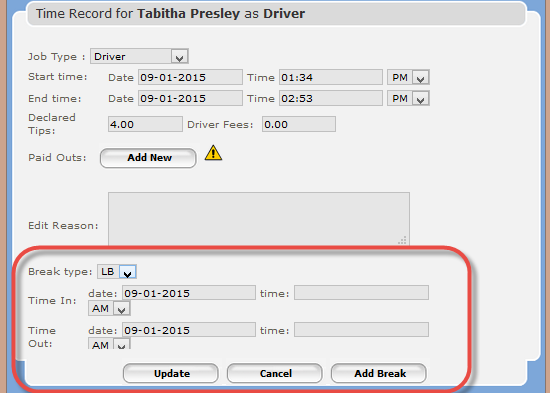 Clicking this gives you additional information and allows you to edit an existing time record. See below for more details. Job Type: Shows what job type the employee clocked in as. Some employees can have multiple job types such as server and driver. Date: The date the employee clocked in. Start Time: The time the employee clocked in. End Time: The time the employee clocked off. Total Paid/Unpaid Breaks: The total break time that was taken. It is split between paid and unpaid breaks. Total Paid/Unpaid Lunch: The total lunch time that was taken. It is split between paid and unpaid breaks. You also have the ability to print this report or export it to Excel. 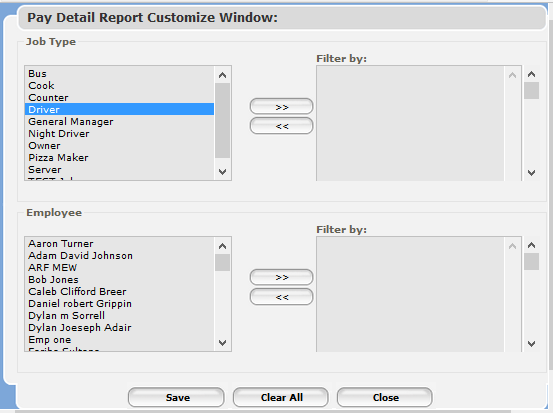 You can create a new timeclock record directly from the report by clicking on "Create New TR." Select the job type you wish the record to reflect, enter the start and end dates and times and click OK. The new record will be added to the report. To edit a time record; click on the TR. The time record will appear. 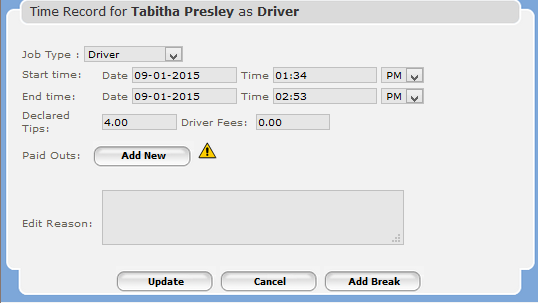 In the time record edit screen, you can change the job type, edit the start and end dates and times, update the amount of tips that were declared at the time of clock off, and update the driver fees. It is best practice to include a edit reason when you edit a time record. If an employee took a break or lunch and did not record it; you can add the break/lunch time by editing the time record, and then by clicking on "Add Break". You can select the break type (lunch or break), enter in the date and time the break was taken. When you click "Update" the record will update with the new information and show as edited on the report. For break records, just edit the start / end times, and be sure they are within the start / end times of the overall time record. You can use the "Customize" button to limit the employees you see on the report, if you wish to view an individual employee's time records or those for a department. Press the Customize Button. Select a job type or an individual employee, and use the arrows to move to the "Filter By" section on the right. Click save to regenerate the report with these values.